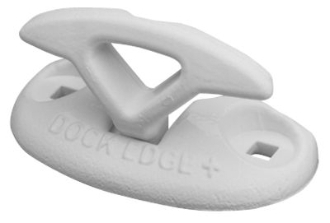 Our Products >> Dock Edge Flip-Up Cleats 8"
This Dock Edge Flip-Up Cleat is great addition to any dock where safety is the highest priority. Designed to fold down to a low-profile base and conveniently flip up when needed, these Flip-Up Cleats are made from premium marine grade aluminum and finished with an attractive white polyester powder coat for durability. All surfaces are smooth and rounded. Dock Edge Flip-Up Cleats 8"